Our dental office serves the Paradise Valley area with your utmost comfort in mind throughout. There are large flat screen TVs mounted in each room for you to view satellite TV, movies and relax during treatments. This combined with the latest technology provide you with the quality and safety you need for dental surgery. Dr. Kidess and her team of dental professionals provide quality cosmetic dental surgery to improve your smile. We also perform dental surgery to remove teeth, root canal treatment and other oral health procedures. Sedation dentistry is a common part of many major dental procedures such as root canals or wisdom tooth extractions. Dr. Kidess is a board certified sedation dentist serving the greater Paradise Valley, and Scottsdale, AZ areas. 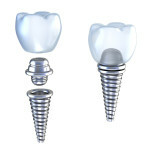 Dental implants: If you have one or more damaged or missing teeth, these can be replaced with dental implant surgery. Dental implants use artificial tooth roots that are fused into the bone to support crowns, bridges or dentures. These provide a strong foundation for replacement teeth that look and feel as natural as possible. Dr. Reem Kidess is one of the top restorative, cosmetic and sedation dentists serving Paradise Valley, AZ. If you believe you may need a dental surgery procedure, contact Dr. Kidess today at (480) 991-2290 to schedule an appointment.